I've known my whole life that I wanted to run my own business. I started out like many do, mowing lawns and painting houses. Following school for both geology (’84) and hydrology (’86), I ended up working for several engineering firms in New Hampshire. I still had the entrepreneurial spirit, and started Exeter Environmental Associates in 1990. The work has always been a nice mix of office time and being in the field. I kept it small, working with both my wife Julie and my cousin. The work involved supervising oil spill cleanups and performing environmental investigations for private clients, banks and insurance companies. The office has always been in our house above the garage. This may not suit other people but I loved it. My active hobbies were riding a mountain bike and surfing the ocean waves in a kayak. I always thought that if anything were to happen to me, it would be during surfing. I was wrong and managed to break my neck at C5 while mountain biking in April 2013. I was 51 years old. During my eight weeks of rehab at Spaulding Hospital, I learned how to use a Headmouse device to run a laptop and to use Dragon voice recognition software. I will be the first to admit that I was at a loss as to my future. My first priority was to get as healthy as possible. Like many, I thought that I would recover and one day walk again, never dreaming that I would be wheelchair-bound. Upon discharge from Spaulding, I went home and worked at outpatient rehab for another year. My injury is considered to be “complete” and I have no use of my legs or hands and relatively little use of my arms. My wife Julie and our employee ran Exeter Environmental while I was in the hospital and doing the intensive rehab. My employee decided to leave the business 10 months after my accident. I was forced back into work, which was a change for the better. I clearly remember my brain getting mushy from inactivity in the 10 months leading to my going back to work. Julie and I made a tour of our clients and reassured them that the business was fully functional. The response was phenomenal. Of dozens of longterm clients, only one decided to look elsewhere for an environmental consultant. With funding assistance from the state of New Hampshire, we hired a carpenter to install wood floors downstairs in our living room and to create a work environment. We set up a laptop connected to a large monitor that I use as my base camp. I use a baseball cap with reflective dots to operate the Headmouse and the microphone on my laptop works fine to run Dragon. Julie still has her office upstairs above the garage. She does most of the fieldwork and I do most of the office work. We also partner with a laboratory that provides us extra labor when needed. 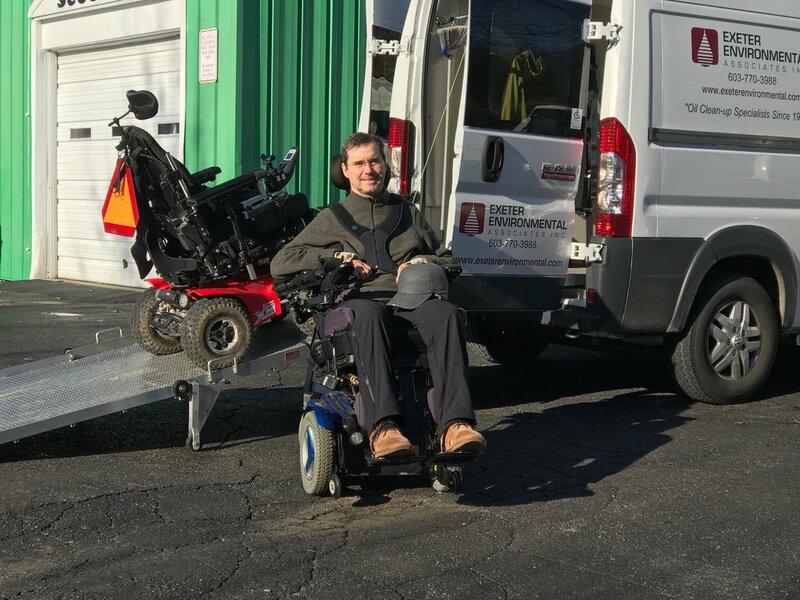 Again with the assistance of the New Hampshire back-to-work program, we purchased an X8 four-wheel-drive wheelchair made by Innovations in Motion. This wonderful machine allows me to get back into the field and do things like supervise soil borings or the excavation of oil spills. This wheelchair doesn't fit in an ordinary van so the business purchased a Ram Promaster with a 12 foot long folding ramp. I cannot stress enough the importance of staying busy, especially with our unpredictable New England weather where those of us in wheelchairs are restricted. 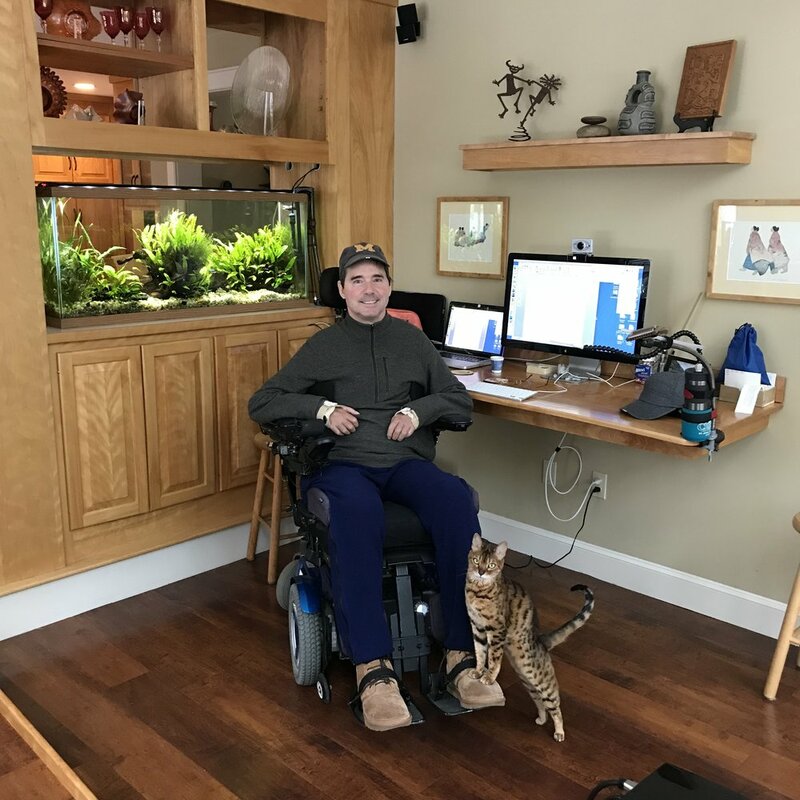 If you have an entrepreneurial spirit and are paralyzed, I would encourage you to set up a home office and start a business with something you are familiar with or interested in. Equally suitable would be to get back to work with your employer before your accident or to start a new job. The job can be volunteer work. Anything to get you back in the game.